"Another spot of interest in the Notch is Nancy's Brook. It was at the point where this stream comes foaming from Mount Nancy into the great ravine that the girl whose name is given to it was found frozen to death in a shroud of snow in the fall of 1788. She had set out alone from Jefferson in search of a young farmer who was to have married her, and walked thirty miles through trackless snow between sunset and dawn. Then her strength gave out and she sank beside the road never to rise again. Her recreant lover went mad with remorse when he learned the manner of her death and did not long survive her, and men who have traversed the savage passes of the Notch on chill nights in October have fancied that they heard, above the clash of the stream and whispering of the woods, long, shuddering groans mingled with despairing cries and gibbering laughter." "Nancy Barton was a girl who was employed at the farm of Colonel Joseph Whipple in Jefferson. After becoming engaged to another of the workers on the farm, she gave her entire dowry to him. He then left the farm and abandoned her. Even though this was in the middle of the winter, Nancy followed him to Crawford Notch but found the campfire cold. 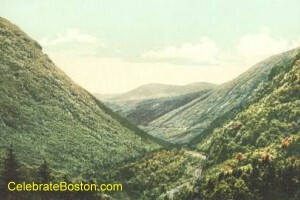 Nancy continued her search through Crawford Notch but became exhausted and fell beside the brook. Another group of men from Jefferson went to search for Nancy and found her frozen body in the snow. Upon hearing of Nancy's death, her lover reportedly went insane and died a few years later. Tradition says that his ghost is still in the valley."